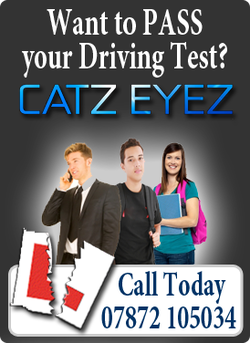 Catz Eyez Driving School offers driving lessons in the Maidstone area. As soon as you have applied for your Provisional Licence, you can give me a call and we can work out a lesson plan to fit around your needs. Don't forget my beginner offer, your first lesson is for 2 hours but you only pay £40.50. This means we have chance to get to know each other and to run through any concerns you may have and also to let you know what level of service you can expect from Catz Eyez Driving School. If you already have your licence, but are nervous about starting to learn to drive, don't be, everyone has to start somewhere and I hope that will be with my Driving School. If you passed your test but haven't driven for a while and feel less confident than you used to, again a few refresher lessons with me could mean you can get over your fear, re-gain that confidence and get back on the road again. Don't like driving at night, on Motorways or on dual carriage ways? Let me teach you to tackle this type of driving with confidence, just let me know how I can help you. I offer flexible pick-ups if required, usually you can arrange to be picked up a home, work or at college. If the drop off point is a different location than pick-up, this must be within my working area and will be dependent on the location of the next lesson, so must be arranged beforehand. But I will always try to accommodate your needs. Why not pre-pay and block book! Block booking lessons must be paid for in advance and you can pay by cash or BACS transfer - more details on request.